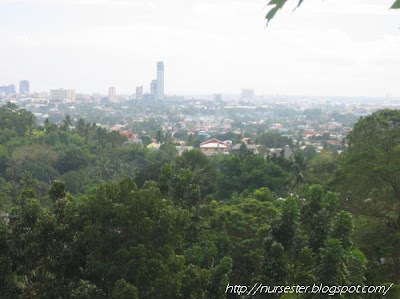 Have you ever wanted to see a sight of Cebu like this one? 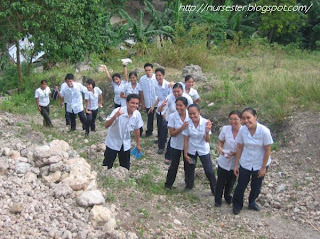 Before I talk about my experience on our first day of COPAR, you may want to check out first what COPAR Nursing really means. 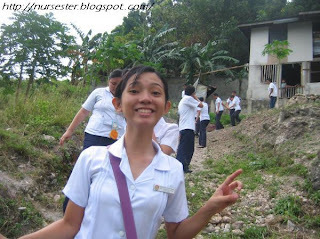 Our first day of COPAR happened last Jan. 20, 2009. Yeah I know, this post is already too late, but don't care anyway. Hehe! I just have to post this one because it's one of my greatest experience in COPAR. 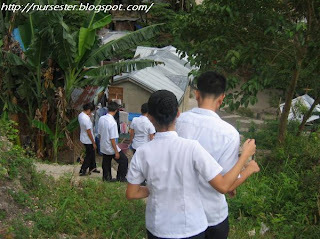 Our group was assigned in Barangay Buhisan, Sitio Nazareth, Cebu City for our COPAR Nursing. Before we arrived at the place, our Clinical Instructor already told us what to expect in there. he said that the place was settled in a Valley, and you can just see Mountains around you where most houses are settled. And he was right! We still actually have to climb mountains just to interview a family for our Family Health Assessment form! But this actually, is what makes COPAR so fun and exciting. The first picture above was taken at the peak of the mountain we climbed on our first day. Very scenic right? But before you can reach that, you have to go through a series of "phases" first! That's steep you know! You may think it's easy but it's not! This is where we can test our BALANCE It's very easy to slip because of our shoes and because of the rocky road. Actually there were some who slipped that puts us to the next phase! See? I told you it's not that easy! Imagine if one falls, then all the other people behind might also fall! This phase is where we can test our FEARS and EMOTIONS. Now that were at the top, all the fears, the anxieties and the sobbing are gone. But then, vanity strikes again! tsk3! I wonder what test this phase gave to us?? ?_? Actually, climbing down the mountain is much harder than climbing up! This is where we can test the STRENGTH of our leg muscles! Now, who said being a Nurse was all Boring Hospital Stuffs?? Hahaha sigeg laag bai oi. Layua na ninyo naabtan nu... Mga but-an jud mo. Uhm, nagjoke raman ko ato bai. Hahahaha. Hahaha! Vanity in all pictures naman! Pero that experience looks exciting. Reminded me of my college years. hahaha! 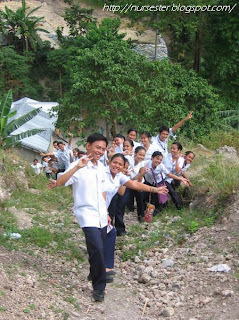 tama ka rin.. kahit hirap na hirap na kami,, tuloy pa rin ang picture taking! hahaha! UU ate! napakasaya namin dyan! hehe! 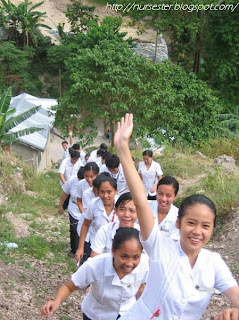 Buti nga kami may ganyang experience kami,, sa ibang nursing schools wala nang COPAR.. they miss half the experience being a Community Health nurse.. hehe! hahaha, saya talaga sa community noh? oh, kay nag-igat2x lang man siguro mo. mao enjoy, wala learning.